The start of every school year brings all sorts of images to mind: shopping for clothes and school supplies, getting back into a routine of dinner and bedtimes that may have become relaxed during summer, and relief from arguing siblings who have been stuck together 24/7 for the past three months. 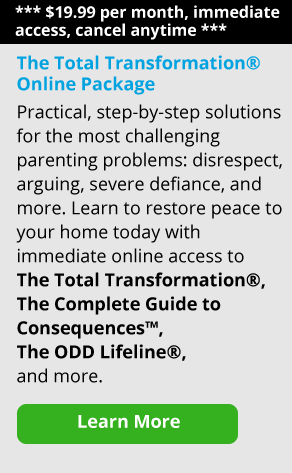 Many parents are relieved when school starts up again, but for parents of Oppositional Defiant (ODD) kids, this is often a time of anxiety and even dread. As long as you’re doing your job, it’s your child’s responsibility (and ultimate choice) on whether or not to take you up on those opportunities—and to deal with the natural consequences and find a new path if he doesn’t. We’d start the day fighting to get our son up. Even when he was only seven, he’d make himself a dead weight in the bed. Once we got him up, the next challenge was getting him dressed. He literally struggled, argued and fought against every effort we made to get him ready. Long after the school bus passed, he was still in his pajamas, kicking and yelling. In the end, we had to pretty much drag him into the car and my husband would dress him as I drove. If there hadn’t been two of us, he never would have gotten into the car. We’d squeal into the parking lot as the warning bell was ringing and hand him off to the school staff, peeling out before he could scramble back into the car. Then my husband and I would try to pull ourselves together as we faced work and the calls we’d be getting later in the day about our son’s poor behavior. Mornings with our other child were completely different: there was breakfast, getting the backpack together, brushing teeth. There was a routine. Was school particularly more traumatic for my ODD child than any other kid? No. He went to the same school as my other child – a school that was free from gangs or serious violence. He was a bright child — gifted in fact — so the work itself wasn’t a struggle. If anything, he was bored. So why did he refuse to go? He just didn’t want to. That’s it. There were other things he’d rather be doing than sitting in class and because he was ODD, he didn’t have the personality that cared about the expectations of his parents, the school or society. He didn’t care that the law said he must attend. He didn’t care about consequences for us — or himself. The adults in an ODD child’s life have expectations for that child’s behavior and performance. We expect our children to attend school, be on time, respect the rights of others, follow the rules, do their classwork and homework. The problem is, the expectations of society and parents aren’t usually a priority for ODD kids – their own wants and needs are. Adults continue to hold onto those expectations long after it’s evident a child is refusing to comply. The result for many parents of ODD kids? Daily power struggles. Is that YOUR Kid?! The One Who’s Always In the Principal’s Office? Many parents we’ve known have shared experiences working with their child’s school that have left them feeling ashamed, humiliated, frustrated and at times downright furious. It’s a powerful system to encounter and when your child is the one who insists on doing things his or her way, it can turn into an “us vs. them” situation. If your child’s school is open to working with you as a team, that’s wonderful. Many teachers and administrators understand that parenting an ODD child is extremely difficult and offer support when it comes to that child’s education. But often the stress parents and educators feel when dealing with a challenging child comes together in the perfect storm. Everyone starts looking to each other on how to control that child and whose fault his behavior is. Somehow – even though you’re miles away—your daughter’s refusal to participate in an activity or your son’s refusal to do his classwork becomes a reflection on you. The focus can get way, way off track and instead of holding the child accountable, it turns into a blame game. Communication is Key. Communicating with school staff can often feel like an intimidating task. But remember that your child’s teacher and school administrators are often just as frustrated and unsure how to handle his behavior as you are. Try to remember that you’re all working toward the same goal: for your child to become an educated, productive member of society. Keep a notecard handy that reminds you of this goal and pull it out anytime you have phone or in–person contact with the school. Keep Your Child Responsible. As adults, we can do everything in our power to offer educational opportunities to our children. Transportation, supplies like books and pencils, support in understanding the classwork, clearly communicating rules and expectations are all things we can control as adults. However, in the end, it’s up to your child to take advantage of those opportunities. Short of putting the textbook on his head and hoping the information just seeps into his brain, there’s no way to force a child to learn material when he is refusing. If he does refuse to complete the work he’ll still learn – he’ll just be learning that there are natural consequences to his choices. Make Your Child an Educational Partner. Remember: this is your child’s education, not yours. You’ve already gone through school. Perhaps you graduated, perhaps you didn’t. Perhaps yours was a good experience, perhaps it wasn’t. Particularly as she gets older, your child should be an active partner in her educational experience. What does she want? Are there alternative education opportunities that might better meet her needs and still meets society’s legal expectations? Be open to your child’s ideas on what needs to happen for a successful education. Try Not to Predict the Future. Most of us get frightened – even terrified – when our kids begin to struggle in school. If my child is struggling in the 2nd or 4th or 6th grade, what will happen down the road? The worst case scenario: he may not graduate. That thought strikes fear and disappointment into the hearts of many parents. But what’s the worst case scenario here? Many people succeed in life even though they decide to take an alternate route. Jobs in the trade and service industries are no less valuable than those that require college or even high school diplomas. Many, many successful people chose not to take their parents and the school system up on the opportunity for a formal education: Ansel Adams (famous photographer), Bryan Adams (singer/songwriter), Nora Roberts (bestselling author), Carl Lindner (self-made American businessman and billionaire), Kevin Bacon and Johnny Depp (actors), Sonny Bono (singer and politician) are some names that come to mind. And remember: just because a child doesn’t take advantage of formal education now doesn’t mean she won’t return to it later in the form of a GED, night school or a college placement test. Having said this, there’s no way to predict that your child won’t successfully graduate, despite struggles in school. But fear can lead us to react, as parents, in a way that contributes to our child’s negative school experience. In today’s world, parents and educators sometimes put more effort into a child’s education than into the child himself. Education is about more than “book learning.” It should be the time when our children begin to learn about the real world and how they will navigate through that world successfully. It’s our job as parents, educators and as members of society to offer every child the opportunity to have a formal education. It’s our job to provide a safe environment and ensure that our children have the tools to support them in their learning. If a child is struggling, we need to look at what may be going on. (Is there a learning disability, is he being bullied, is there something interfering with his ability to do well in school?) As long as you’re doing your job, it’s your child’s responsibility (and ultimate choice) on whether or not to take you up on those opportunities—and to deal with the natural consequences and find a new path if he doesn’t.